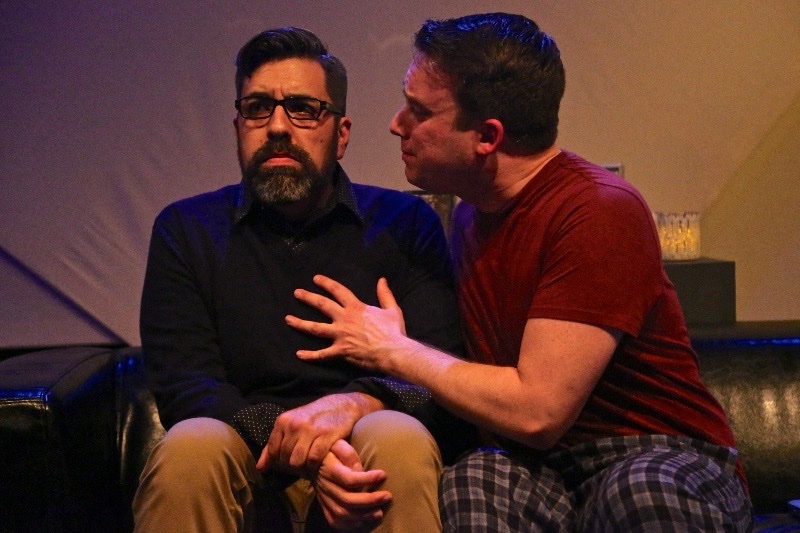 “Next Fall” by Geoffrey Naufft's now currently playing at OnStage Playhouse through March 25th is a poignant, contemporary laced with irony and humor play about being gay. It’s about believing and not believing. It’s about friendship and family, geography and history and past and present. It has it all except solutions. But more importantly, he does not question the dogma of his childhood teachings and is at peace with himself regarding his evangelical Christian beliefs around life and death (“When the time comes… I welcome it”). He knows Adam is a non-believer. “I never had that in my life, so how do I know for sure…everything’s gonna be all right”? But they have bigger problems than Adam’s non-religion, religion. Luke’s parents don’t know he is gay. He has yet to come out, explaining to Adam that ‘next fall’ when his younger brother goes off to college he will deal. So far, he has been able to manage the gay issue. His mother Arlene (Susan Bray) and Dad, Butch (James Tarbert) live in Florida and have been separated for years. He is pretty much on his own and ‘safe’ in New York. Luke works in a candle shop that is owned by Adam’s best friend, Holly (Kira Vine). He aspires to be an actor. Adam is a substitute teacher, and wannabe writer. He is older and somewhat of a hypochondriac, which is where most of the humor comes in. Adam and Luke have their differences and may or may not have worked them out. We will never know because of the tragedy that will bring all these good folks together; Luke is struck by a cab and is in a coma on life support. The story weaves back and fourth, (Bruce Wild designed the flexible set and Susan Stratton and Bruce Wilde designed the projections) past to present and back again giving us snippets of how they met, what their life looks and looked like to some degree, and how they came to be the men they are today. When we meet the entire family they are in the waiting area of an ICU at a Jewish Hospital in Manhattan. 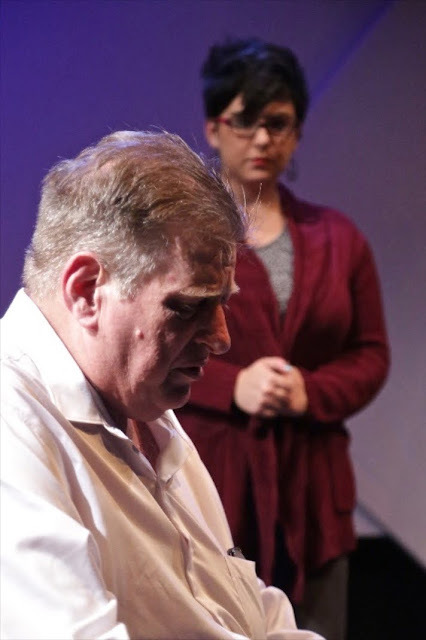 (This play has it all, Jewish, Agnostic and Fundamentalist Christian). Luke’s Mother Arlene (Susan Bray is wonderfully over the top as the discombobulated recovering addict whom we later learn has fallen off the wagon) is in a constant state of dissaray. She does it well. When Holly mentions to Arlene that they sell tchotchkes and things in the candle shop, Arlene wants to know if it’s a Jewish thing like bagels. Thankfully, when push comes to shove, she finally has the spine to face the reality of her son’s sexuality. In fact both parents do in their own time. His irritated and narrow-minded father Butch is also present in the hospital waiting room, but prior, Butch paid a visit to his son's New York apartment and if he didn't see the clues regarding his sexuality its only because he didn't want to. Both parents have just arrived from Florida. Butch is furious to learn that the cab driver has no insurance or green card! Butch paces and challenges everyone. I suspect he knows more than he lets on just by the attitude he has toward Adam throughout the play. Tarbert’s actions and reactions are homophobic appropriate. He doesn’t endear himself to anyone although I did feel a twinge of sympathy for him at some point. “Who let’s these jackasses across the border, that’s what I want to know”. “I’ll sue the whole damn city if I have to”. And so on. Long time friend Brandon (Chris Tenney), a bible studying property developer and friend Holly are already at the hospital when the play opens. I understand Holly’s involvement in Luke’s life; she is after all his friend and boss. She came into his life by way of Adam, who used to work for her as well. But the character of Brandon is like a hanging chad and is never really fully explained. One has to wonder why the playwright needed his character. I never understood it. Kira Vine's Holly is credible as more of a reality check and neutralizer for everyone. Her timing is spot on every time she’s in a scene; it lends credence. Susan Stratton directs “Next Fall” with an eye focused more on the lighter side of playwright Nauffts’ a la Neil Simon style one-liners while the real issues are sidelined. It’s frustrating to watch Adam, who is not allowed to see Luke when he finally arrives at the hospital after coming home from a high school reunion. Bejarano’s Adam huffs and puffs, frowns, raises his brows and tugs at his sweater but never puts his foot down to confronting Arlene and Butch. After a while it becomes old hat and fails to convince. Butch has notified the hospital personnel that ‘only family’ can go in Luke’s room. Why Adam just doesn’t tell Butch what he already knows and put him out of his misery is a mystery. Throughout the play Tarbert’s Butch, a larger than life presence grows into the part. Conway’s Luke is much younger, and eager to please, yet fully committed to his views and teachings. The contrasts in their life styles reflect their differences in just about everything they do and believe. Talk about opposites attracting, this is a classic case. The relationship between the two, regardless of their disagreement, works and is believable thanks to Conway, a real cutie with enough charm to win this reviewer over. Throughout we keep on rooting for Luke to recover and for Adam to have time to spend with his lover. It deserves to be seen if for nothing else but to understand the corruption and hypocrisy that takes place within the religious community (churches/synagogues) when the gay community is condemned and vilified. When marriage equality is shot down it affects the whole community. 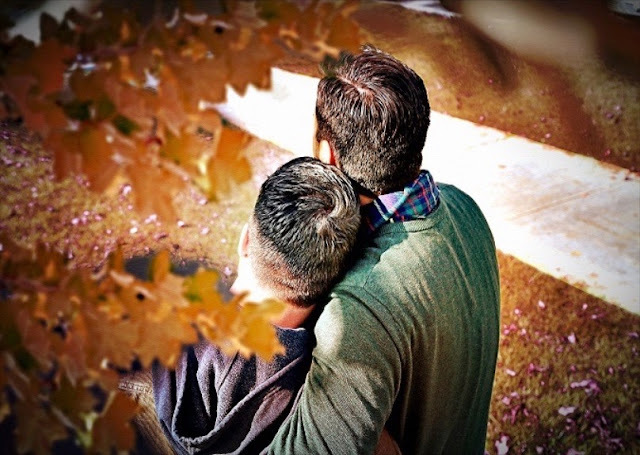 Thankfully just now some of the churches and synagogues have become gay friendly. It's about time. When parents refuse to see their offspring as they are and when children and or young adults do not feel safe sharing with their own parents their sexual preference and when young people feel the need to kill themselves because they are different, attention must be paid! “Next Fall” opened off –Broadway in 2009. In 2010 Drama Desk Awards nominated it for Outstanding Play. It was also nominated for a Tony as Best Play. Sadly, some things never change or they seem to regress and crawl back into their mythical shells. Today the gay community is more at risk of having their civil and human rights taken from them than in the past. All the gains made before Trump and Pence are in jeopardy and that is in itself is scary. As a relatively new comer to OnStage productions, I find it rewarding that the board is willing to mount controversial and more importantly current and oft times politically challenging topics, and do it wholeheartedly. Congratulations.